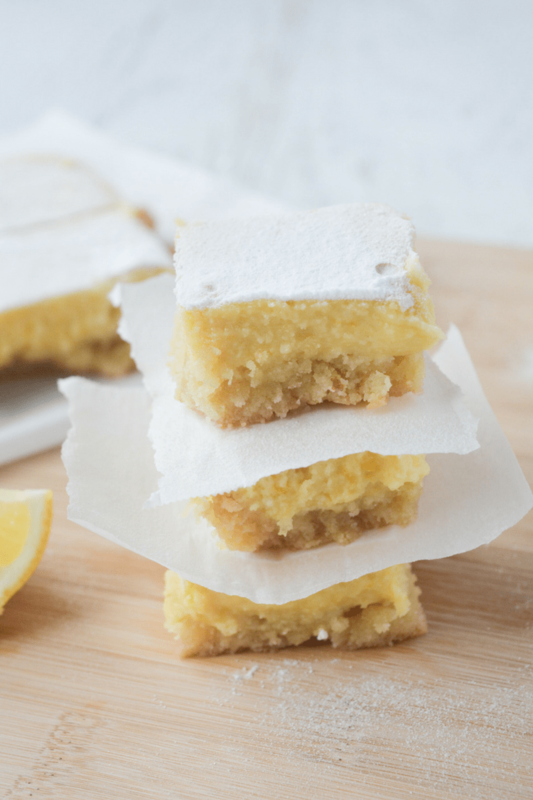 This recipe for keto lemon bars is an absolute low carb dream! With only 4g of net carbs per serving, you’ll be happy to indulge in this bright and tangy treat without a shred of guilt! Are you missing fruity goodness on your keto diet? I’m not one who subscribes to the belief that keto is a “no fruits” diet, and this is because I think many fruits are still great whole food options, that are nutritious than other artificial foods. But some fruits are very high in NET carbs (total carbs minus fiber minus sugar alcohols) for someone following keto. This is mostly because of the high amount of natural sugars. Because of this, I would say those aren’t great options for Keto, but other fruits, like berries are much better. One cup of blackberries is about 6 net carbs, one cup of raspberries is about 7 net carbs, and a cup of whole strawberries is about 8.1g net carbs. Those numbers are much better, and when you think about it…one cup of any of these fruits is a pretty significant amount! I love to put lower carb fruits into my desserts, like in my Keto Yogurt Recipe so I’m super excited to share this recipe with you…it’s a real winner! Thanks so much to Tasteaholics for letting me share this recipe! 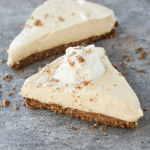 It comes straight from their Dessert in Five, eCookbook, which features 30 DELICIOUS recipes that all can be made with just 5 ingredients and are only 5g (or less) of net carbs per serving! There’s also Breakfast in Five, Lunch in Five and Dinner in Five. The best option would be to buy the whole bundle. You won’t regret it! The fruit in this recipe is lemons…which are about 3.4g net carbs per fruit. And you’re not using very much of it so the carbs stay low! 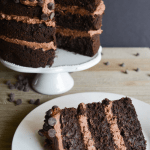 The other hero of this recipe is what makes it sweet…erythritol. Erythritol is a mild sugar alcohol with a glycemic index of 0. It’s my favorite sweetener, and I believe the powdered version is the very best. It tastes and bakes like confectioner’s sugar, AND really cuts down on the cooling effect that erythritol typically carries. 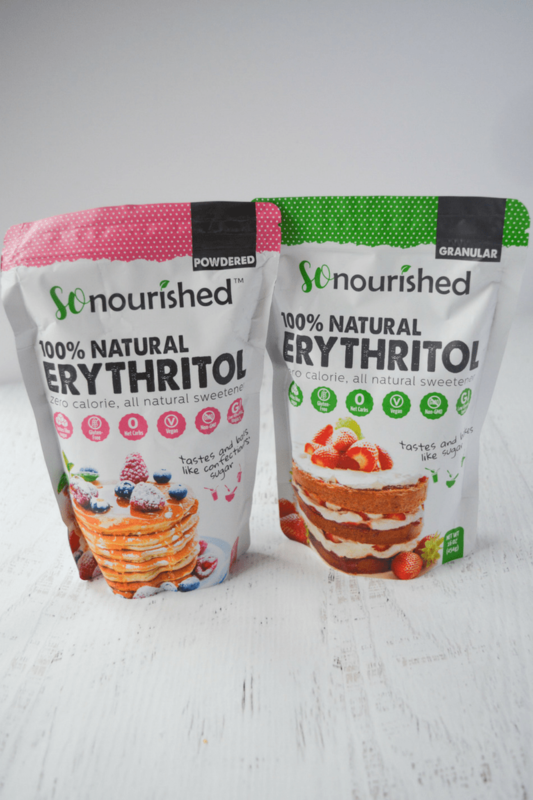 And what’s REALLY cool, is Tasteaholics has their own brand called So Nourished that manufactures affordable erythritol! You can buy it on Amazon along with their Ketone Test Strips and Hand Held Spiralizer. If you’ve been following me for any amount of time, you know that I love to support small business, so I’m so happy to promote this quality brand! 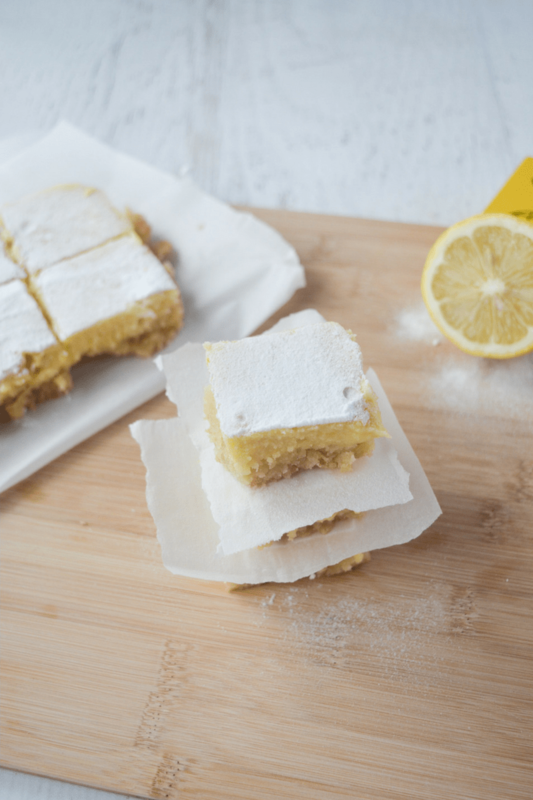 You and your guests will be left satisfied after these dense, wonderful lemon dream bars! Finish them off with lemon and a sprinkle of erythritol. Mix butter, 1 cup almond flour, 1/4 cup erythritol, and a pinch of salt. Press evenly into an 8×8″ parchment paper-lined baking dish. Bake for 20 minutes at 350 degrees F. Then, let cool for 10 minutes. Into a bowl, zest one of the lemons, then juice all 3 lemons, add the eggs, 3/4 cup erythritol, 3/4 cup almond flour & pinch of salt. Combine to make filling. Pour the filling onto the crust & bake for 25 minutes. Serve with lemon slices and a sprinkle of erythritol. If adding vanilla extract to crust is something you’re used to, feel free to mix 1/2 tsp into the crust. I recommend letting the bars cool for at least 30 minutes before cutting. Cutting the bars with unflavored dental floss is a GREAT way to get a clean cut. I made these last night and my crust portion is way too greasy. It won’t hold together. Seems like too much butter. They taste good but next time I’ll use half the amount of butter. After reading several posts regarding the crust not holding, I put the oven rack up one above the middle, it came out great! Thank you for sharing the recipe! I followed the exact recipe, and while the crust did seem a bit greasy, it stayed together and worked well perfectly! It came out great, thank you for sharing this recipe! HI, I ALSO FOLLOWED THE RECIPE BUT THE FILLING DID NOT RISE NOR WAS IT CAKELIKE. DID YOURS? Gonna try this! I love lemon bars!!!!!! So I followed the recipe, but the “crust” didn’t set. Not sure if that’s normal, or should I bake longer before pouring in the lemon filling. Anyone have any experience with this? Looks like an amazing recipe and I can’t wait to try it al many others on this lifesaving website! I doubled the recipe and used a 9×13 pan, cutting them into 24 pieces at 1 net carbs each! Hi – I made these and the topping is very gooey and doesn’t seem to have cooked all the way through. Is that the right consistency or is it supposed to be firmer? It was slightly jiggly but did firm up. If you make these again, definitely do add it back in the oven briefly if it seems gooey until fully cooked. Made these today came good but the crust was a little crummy. What did I do wrong? Mine were a little bit crumbly too. Were they fully cooled? sometimes if they’re even a bit warm still it can be overly crumbly. Once I stored mine in the fridge and ate them chilled, it improved even more. Omg these are wonderful! Do you have to refrigerate them? Should I refrigerate the left overs? Mines turned out delicious!! Crust was great!! I’ll make these often. Thank you!! These are awesome! I want to make again, using the crust recipe and then changing it up and maybe doing a blueberry or strawberry topping. I don’t have lemons, but I have lemon juice. Could I substitute that for the real deal? How much would I use? I would definitely recommend the real lemons because the taste will be much better/fresher, especially with the lemon zest. Unfortunately I’m not sure how much lemon juice you could substitute with. 1 lemon is worth about 2 tbsp on average, therefore you would use 6 tbs of lemon juice and 1 tbs of juice as a sub for the zest. 911! Is the filling supposed to be loose? I think my lemons were too big. I added more almond flour but it’s very runny. Should it be like cake batter? Were you able to figure out what happened? Mine was very liquidy. It was a lot of lemon juice but don’t think too much. They taste so good!! However, the erythritol seemed to recrystillize in the crust. Has this happened to anyone? Any tricks to prevent this? I used to Monk sugar because it’s all I had, and it wasn’t powdered, but it seems everything turned out fine. I also used french butter, and it was the first thing you tasted. It was my first time using french butter, you should try it, there is a big difference from the Land O Lakes I’ve been using prior. I ADORE Land O Lakes butter and can tell when someone uses a different butter just by the taste. Does the French butter have a better taste than my favorite?? How so?? I made these last night but used granular Swerve instead, as that is what I had. I was a little light handed with it – so maybe a quarter inch below top on my steel 1 cup measure. I was still worried it would be too sweet due to the difference in granular and confectioners. It actually turned out perfect for us. Husband and I both love them. Crust held together, but was really buttery and a little loose while still warm, but so, so good. Stored in fridge, it firmed up nicely and is delicious cold as well. A great recipe. Will order the powdered erithritol for next time. Could Stevia work in this recipe instead of erithritol? Looks so good! Would you recommend any alterations for high altitudes? Could I use real lemon juice with this instead of going out to buy the lemons ? And how much would I need ? Yes you can but I don’t know how much. I would recommend using fresh if at all possible. I do think the fresh lemon flavor is different than bottled juice. Also this recipe calls for lemon zest which I think adds an important depth of flavor. My husband has a nut allergy. Is there an alternative to almond flour? You can use coconut flour but I personally haven’t tried it. It’s more absorbent and requires a different amount than the almond flour and may make it taste like coconut. There are some good recipes for crusts on google that should work. Hope that helps! Technically, coconut is still considered a tree nut so I recommend being very sure he’s not allergic to that too. Coconut is a fruit. Some do and some dont react to coconut if they have a tree nut allergy 🙂 We have a tree nut allergy ad are making this with coconut flour…no issues. Coconut is a fruit, not a nut. Is there some type of icing on those in the picture? Nope, that’s just powdered erythritol. These were absolutely fantastic! My husband said he wouldn’t have known they were low carb, that’s how yummy they were. I actually think these are better because they are not as sweet as the traditional ones! I doubled the crust recipe to make it thicker and added whipped cream on top. So wonderful! Anyone try the lemon bars without the crust? What did you think?? I am a reluctant cook and baker however since switching over to Keto woe I have been baking a lot more. I made these today and they taste incredible. So yummy. I often make substitutions and hope for the best. I did substitute a few things here and they still turned out great. I can’t eat anything with sugar alcohol so finding a great sugar substitute was a challenge. I have been using Kakato sugar substitute and it worked great. For the filling I only used 1/2 cup instead of 3/4. I also did not have lemon zest or fresh lemons. I used non-GAO lemon juice—8 tablespoons and it tastes fantastic. For those that asked about type of butter….I always use Kerrygold or another grass-fed butter. I also baked the crust for 5 extra minutes since it was still so wet. I also baked the entire dish for 5 extra minutes. The crust was awesome due to the buttery crunch with the extra baking. I hope this helps other novice bakers out there. I made this tonight and used pyure organic stevia blend (granular) and it came out very bitter. Do you think if I use the powdered version would taste better? Or I don’t know maybe my lemons were to tangy. Do you typically use stevia in your desserts? Powdered may help but I’m not sure. I don’t really use stevia because it tastes extremely bitter to me in most forms. I think that varies by person. Sometimes products blend erythritol and stevia to make them less bitter and counteract the cooling effect of erythritol, which I think helps. You may try one of those blends if stevia alone is too bitter to you. Came home and made these this evening. My second time baking them and I absolutely love them. The look fantastic and taste even better. You know it is easy if I bake them on a Monday night! I can’t rate the full recipe, since I only madethe crust portion as a bottom for my lemon curd tart. But it is yummy! I used liquid monk fruit sweetener and it can out delicious and perfectly cooked in 20 mins. Thank you! Can the sugar substitute be swerve instead?? I just attempted these and because I was apparently having a brain cramp 😀 I put in coconut flour instead of the almond flour in the crust. I knew as soon as the scent hit my nose but by that time I had a choice of going with it or wasting the coconut flour and an entire stick of butter. I had my doubts, but I went ahead and made the crust as was. It seemed okay after baking, so I went ahead and made the lemon layer. These bars are amazing! The lemon set up just right and has the perfect amount of tang. I still want to try it with the almond flour crust… It will probably be a bit more crisp. But the coconut flour version wasn’t bad at all! If I wanted to double the serving size, how much would the amount in the ingredients change? Just made these tonight. Thank you so much for sharing the recipe. My husband and I are loving it. The flavour is so dense that we can only have 2/3 a square each. And it fills any desire for a little something sweet. ???? My very first keto treat and WOW! I can’t speak for the baking dish route but I had to use a cast iron frying pan and everything cooked PERFECTLY. Nice browned crust that didn’t crumble, perfectly cooked and non-gooey top. Next time I’ll add some rosemary or lavender because this recipe is going to be hard to move on from. Thank you! I have been living low carb/ keto for around 10 years, and this is by far the best cake recipe I have found! It is soooo delicious with the fresh lemon, crunchy crust and creamy filling. I will definitely be trying more of your recipes, thank you so much for sharing this! The recipe is fantastic and such a treat thank you! Personally I wld go a little sweeter and more lemon. We loved the crunchy “sugar” sprinkled on top. I had my son asleep on me so baked the base then couldn’t get to the top until probably an hour. Baked it with the topping and let completely cool for 2 hours and omg my kids loved it too, definitely a winner. I also only had xylitol and limes but swapped them out and it was perfect. The BEST part is it’s so easy and very little ingredients ???????? I tried this tonight and loved it! I, too, have a very soft crust that is releasing a bit of butter. However, it may stabilize once it sets in the refrigerator. If not, I will reduce the butter by a 1/4 until I hit the right amount. Since it’s just me, I plan to see how well they freeze. I’ve missed lemon bars since I started Keto, so this was a welcomed discovery. This are amazing! I’ve eaten Keto for 3 1/2 years and this is by far the best dessert I’ve had! I don’t bake often but since I’m on Keto I’ve been baking a lot more. I’ve never zested lemons. Can someone’s tell me how much of the lemon zest do I put in this recipe? Okay… so I looked up zesting lemons and now I feel stupid for even asking that question. I followed to a T and it was nothing like the picture – not dense at all. Very soft and WAY too tart. I used everything exactly as described. I love to cook, and have never had a recipe turn out so badly. Your picture looks like it rises, and is cake-like. Mine was about 3/4″ – 1″ high and very soft. The crust was soggy and the filling was like a hard custard. Totally confused by this recipe and hesitant to try it again as the powdered erythritol is so expensive. So delicious! I’ve made these for my non-keto family a couple of times and they love them, too. Definitely one of my go-to desserts. Easy to make too! These were phenomenal! Me and my roommate agreed when we think of lemon bars we think of more lemon flavor (that sweet tartness…mmm) So, next time I wonder if I should add the juice of 1 more lemon or the ZEST of 1more lemon. Which would possibly add more lemon flavor without compromising the performance of the batter? Also, I added extra (didn’t measure) sugar (maybe like less than 1/4 a cup and extra Almond flour. I am pretty intuitive as an untrained cook or baker so the batter looked a bit runny for my taste so I thought I would “stiffen” it up. Took the risk and it was AMAZINGGGGGG…. So, apart from adding more lemon (suggestions), these were ammmmmmmmaaaaaaaaaazzzzzzzzzinnnn… Crumbled some on top of my cake batter HALO TOP icecream. My roommates keep asking for more each day. And I’m excited for it to be gone so I have another reason to bake something. Thanks so much for the recipe :)!!! These are absolutely spectacular – thank you so much for sharing! Mine turned out perfect – i baked the base until firm, let it cool, then added the lemon layer. Sliced when still warm, but put into the fridge to firm up – looked beautiful (even when sliced with a knife) and held together perfectly! I made them. They went together great and smelled great while cooking. As for taste…yuck! I threw them in the trash. Made these! So delicious, thank you so much for creating this keto approved recipe. 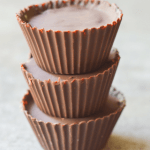 I had a terrible sweet tooth before starting keto and so when I get a craving for something sweet I love finding keto approved recipes to try out. This was so quick and easy and tastes the same to me, maybe even better, than regular lemon bars. I cut these smaller than normal to limit the calories a little bit more, basically made bite size pieces. Thanks again, love this recipe! Do you have a preferred almond flour? There are so many options! 2x I tired crust -18 minutes black so threw it away and tried again. Now at 10 minutes 1/2 is dark brown like burnt. Not sure if it’s even worth adding filling. It’s an expensive mistake to keep making when following directions. These are perfect, lemony, creamy, super tasty. For those of you asking about lemon juice, you will miss the zest, but per the real lemon bottle, 3 tbsp juice per lemon. These bars are amazing! I did use half the butter and cooked the crust five minutes less. The filling did need an extra five minutes cooking time. Otherwise the flavor is on point! Can you freeze the left-overs? Dude are we sure these bars are only 4 net carbs? Cause if it makes 8 bars they are very large potions! I’m so scared to love them as much as I do. They taste so good it seems too good to be true. I’m not dreaming, right? One of the things I’ve really missed on Keto is tart sweet things. I loooove sour gummies. This completely satisfied that craving. I’m so happy!!!! Tried these Keto Lemon Bars for the first time last night. As my second ever Keto friendly dessert, these are absolutely amazing. They don’t taste “modified” or “lighter” at all. I followed the recipe exactly, adding 1/2 teaspoon of vanilla to the crust, as the notes offered. The bars have that familiar lemon bar texture once set in the fridge for a while. I definitely recommend fresh lemons, because the natural flavor can’t be beat. Thanks for a delightful new staple! Hi do I need to have the parchment paper up on her sides of the pan also? Or just on the bottom? I found it helpful to make sure it went up the sides too! I made this today. When adding liquid butter it appeared to liquid. I added an extra Tbsp almond flour and coconut. My husband loved these. Thank you for your recipe. Good job! I’m going to try this recipe in individual ramekins. That way the crust and the filling will be intact and portion-controlled. I’ll try to remember to come back here and report on my success or failure with that technique. Sounds like an awesome recipe. Actually, my silicone muffin pan is a better idea for baking these individually. Loved it! Was perfect but mine tasted too lemony maybe mine were kinda large il put less juice in next time! Will be making many though. Thank u!! Made this lemon bar recipe for a work Christmas party and they were a hit, co-workers kept coming back for more. I doubled the recipe and they were perfect. I live at high altitude, over 7,000 ft and the only adjustments I made were a little less butter for the crust and I kept it in the oven 25 min at 350. Also, I used confectioners Swerve as my erythritol ingredient. 20 minutes to bake the crust is way too long. Mine was burnt. Very disappointing. This came out great! Thank you! I had to improvise because I had a craving for sweets, and it was either do it now, or order something bad through grub hub! The only things I changed was I used spenda (all I had), and instead of fresh lemons I used 1/2 tbsp lemon extract to replace the zest, and 6 tbsp lemon juice. My crust got over done because ei got distracted and lost track of which device was running the timer, but they were still great! I will make these again. Thank you so muvh! A few extra minutes but it turned out perfect. 70s said they were too sweet for him. I did notice some crystallization in the crust. I also added vanilla 1/2 teas to it. Made these today!!!! Absolutely delicious!!! Sooooo easy. Only change I made was I added finely ground pecans to the crust, because we love pecans. I do have one question. I’m new to Keto. When a recipe calls for “powdered sweetener” does that mean confectioners sweetener or granular sweetener? I made these a couple days ago and they are so so good. I didn’t have fresh lemon so I used 6tbs bottled lemon juice and a splash of lemon extract. I also used a blend of swerve and monkfruit sweetener. I did not put powdered anything on top, I chose a very thin cream cheese frosting and smeared it on top after it sat in the fridge for a while then I let it sit in there overnight. I tried these yesterday and I have to say they are dangerous! So yummy. I would never guess they were anything other than a decadent sugary lemon square. I will say the crust was nice but while baking the crust rises and the middle sank. I let it cool for a good hour before baking with the filling so it held together perfectly. I just ended up with weird sides that I trimmed off. I might try this with my usual almond crust recipe. I also tried them with fine coconut flakes on top, so good! I might try lime juice next. These bars look amazing! But it seems to be SO MUCH sugar – can I cut it in half? The lemon bars turned out perfect! Will make again. We are using key limes now, wish us luck! These are amazing! I’ve made them twice now. Second time I put raspberries on top of the cooked crust before adding the filing. Delicious! Next time I’m going to use blueberries. It would be awesome to see a measurement for the amount of lemon juice since “medium” is sort of arbitrary. For those who have had success with the recipe if you measured the amount of lemon juice you put in I’d love to know. Thanks! My husband loves these ! He usually doesn’t take a dessert to work with his lunch but when I make these lemon 🍋 bars he ask every time. And fairly easy to make . This time I used Meyers lemons and the zest of regular lemons and a touch of lime zest . YUMMY . Thank you for your recipes I use many . Just made these for the first time for Valentine’s dinner dessert. My non-low carb eating husband went back for seconds! FWIW, my lemons were decent sized, but so were the eggs. The filling was thinner than I’d expected, but firmed up nicely in the oven. And using Kerrygold butter in the crust was a good plan, too. Hi! Do you use the milled almond flour or the regular blanched one? Absolutely amazing! 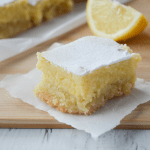 I LOVE lemon bars and this tasted better than any real sugar recipe I’ve ever had. I followed the recipe exactly and it turned out great! 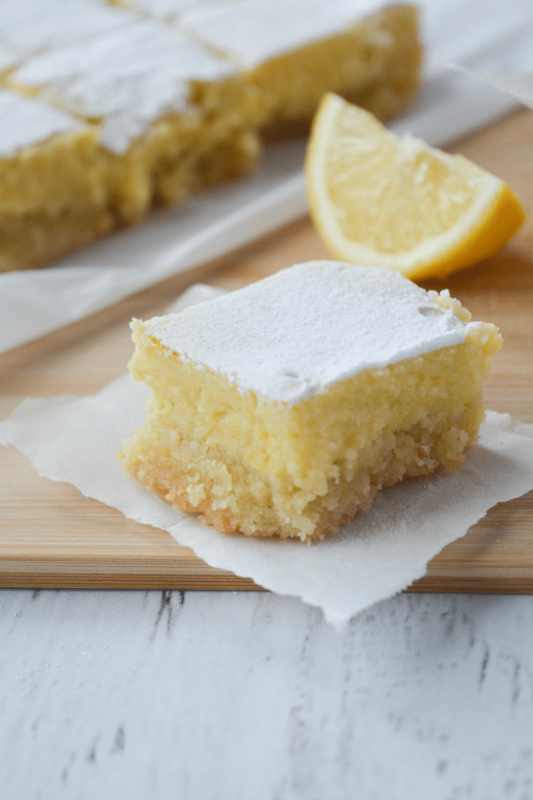 These lemon bars are delicious! They are soft and hard to cut ..Here’s the trick that worked for me I let them cool 30 min and then 45 min in the refrigerator. Then I cut them and put them in the freezer. Eating them frozen is better for me because they last longer than just inhaling them in two bites. Love them! Using only 1 cup for the full stick of melted butter was not enough – was so liquid. Had to add 1 whole cup of flour. Other than that the recipe was good! This is a popular post and I see why! I read the comments about the crust and modified mine by cutting butter in half and adding 1/4ish extra cup of flour and using granulated xylitol. I also baked it 5 minutes longer. The filling I followed to a T and it’s soo delicious! The crust is like traditional lemon bar crust and the filling baked up perfectly in the time suggested. I have a feeling I will be making these more often as they are my husbands favorite treat. Thanks for the recipe!!!! Absolutely my favorite. I love lemon bars before, never tried keto style lemon bars, it was outstanding. I like my crust little on the dark /light brown side, especially when the lemon filling goes on the top of the crust, the crust needs to be well baked. Thank you for sharing your recipe.